world record for the most downloads in a 24-hour period. More than 8 million copies of Firefox 3 were downloaded in a single day yesterday as the SpreadFirefox campaign attempted to set a The campaign, built around the launch of the Firefox 3 web browser, ended last night. The campaign initially targeted 1.6 million downloads, the number of downloads of Firefox 2 in the first 24 hours after its launch. That target was bettered within five hours. At the close of the 24-hour period around 8.2 million copies of the browser had been downloaded, averaging around 6 000 downloads a minute for the 24 hours. 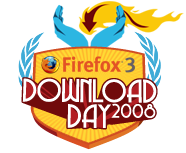 More than 10 000 copies of Firefox 3 were downloaded in Pakistan during this record attempt. The Guinness World Record team will now have to verify the results of the download attempt.